As if it has alighted in front of the windpipe just below the Adam’s apple under the skin in the front of the neck, this important brownish-red gland takes the shape of a butterfly. Small it may be, but it secretes thyroxine (T4) and triiodothyronine (T3), hormones or special chemicals essential not only in childhood but also in adulthood. Explaining some of the important functions performed by the thyroid which is part of the endocrine system, Consultant Endocrinologist Dr. Uditha Bulugahapitiya says that in childhood it is essential for brain and other developments, while in adulthood it keeps all other hormones in control, regulating the body’s functions and activities. Not only does it help regulate metabolism, growth and development, according to Dr. Bulugahapitiya, it also regulates tissue and sexual function, reproduction, sleep and mood. Usually, the thyroid is innocuous and cannot be noticed from outside, MediScene learns but a few conditions could put this gland out of sync causing some problems. 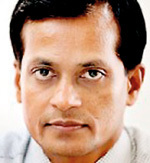 “When the thyroid becomes over-active it leads to hyperthyroidism and, in contrast, under-activity results in hypothyroidism,” points out Dr. Bulugahapitiya who is the President of the Endocrine Society of Sri Lanka. There could also be inflammation of the thyroid in the wake of which will follow short or long term thyroiditis. If the gland gets enlarged, it comes out in the form of a goitre. The worst-case scenario in conditions of the thyroid which is rare would be cancer, he says. This is the excessive secretion of thyroxine (T4), more than the body needs. One of the commonest thyroid diseases in the country, it mainly affects middle-aged people and more women than men. Symptoms – Weight loss despite increased appetite, anxiety, increased sweating, heat intolerance, tremors, hyperactivity and palpitations and in women menstrual irregularities. There could also be an eye involvement such as prominent or bulging eyes, redness in the eyes, tearing, double vision and reduced vision. Then it is clearly Graves’ Disease, says Dr. Bulugahapitiya, underscoring that this is the commonest cause of hyperthyroidism. If there is a heart involvement, meanwhile, there could be heart failure. Diagnosis – A simple blood test to check for the Thyroid Stimulating Hormone (TSH) and Free Thyroxine (Ft4). This test is available at most government hospitals. There may also be a need for an ultrasound scan of the neck. Treatment — Tablets of carbimazole or methimazole freely available in the country. According to Dr. Bulugahapitiya, some patients who take these tablets for about 18 months are permanently cured. If, however, there is recurrent disease, definitive treatment in the form of Radioactive Iodine (RAI) Therapy is essential. He stresses that RAI Therapy is very safe and the only condition is that the patient should avoid pregnancy for six months after such treatment. Rarely, surgery would have to be performed if there is recurrent hyperthyroidism. Hypothyroidism – This is when the thyroid does not produce adequate thyroxine to meet the body’s needs. This disease is also quite common in middle-aged women. Dr. Bulugahapitiya advises that if a woman is sub-fertile and is having irregular menstruation; a young person has high cholesterol; or a person presents with a low heart-rate, hypothyroidism should be suspected. Symptoms – Lethargy, tiredness, weakness, feeling sleepy, feeling cold, dry skin, hair-loss, hoarseness of voice, constipation, joint pains and muscle cramps, depression, weight-gain, menstrual irregularities and sub-fertility in women and erectile dysfunction in men. Dr. Bulugahapitiya points out that these symptoms are quite ordinary and the easiest way to determine whether the person is having hypothyroidism is to perform a blood test for TSH and Ft4. If hypothyroidism is associated with thyroid enlargement an ultrasound-guided fine needle aspiration biopsy of the gland will be necessary to rule out the rare chance of cancer. Treatment – Thyroxine tablets would have to be taken life-long and patient compliance is of vital importance. Dr. Bulugahapitiya emphasizes that women should be advised to have this condition well under control before they become pregnant. There would be a need to increase the thyroxine dose when pregnant as well as follow-up with the doctor regularly. When hypothyroidism is well controlled, it would ensure a healthy pregnancy and a healthy baby. 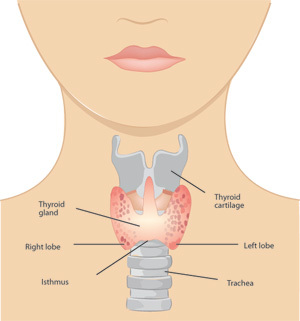 Thyroiditis – This is caused by the inflammation (swelling) of the gland and may lead to either an acute or chronic condition. The acute condition could be caused by a viral disorder which is transient. However, the patient needs to be followed up to prevent a recurrence. The chronic condition is very common in the country and is the main cause leading to hypothyroidism. Therefore, the tests and treatment would be the same. Goitres – This is the enlargement of the thyroid gland which could either become ‘smooth’ or ‘nodular’ (lumpy). A smooth goitre could come about during puberty in children and also pregnancy in women as the gland’s activity increases at these times. A nodular goitre may arise in association with hyperthyroidism or hypothyroidism or even when the thyroid is functioning normally. Once again an ultrasound-guided needle biopsy should be performed to rule out the rare chance of cancer. If there is no evidence of a malignancy and the thyroid is functioning normally just a follow-up with a doctor would suffice, says Dr. Bulugahapitiya, adding that surgery is only required if a malignancy is detected. If the goitre is big and has an adverse cosmetic effect, surgery is a safe procedure. Thyroid cancer – This is not common and even if diagnosed as a cancer, most are completely curable. There is a single, extremely rare type of cancer which can give rise to a bad outcome. Treatment – Surgery to remove the malignancy is essential followed by medications which should be taken life-long. The rare type, meanwhile, needs to be treated aggressively after surgery for a better outcome. Menopause: It’s a time for celebration!